Home » All of Deb’s tales of travel and tech » Deb's Travels » Stranded no more – out of Miami and into Sicily! Still exhausted, but finally out of Miami, Eagle Creek backpack on my back. Do I look human and very happy? I sure was!! I was feeling very lucky! Luis in Miami American Airlines customer service is my hero. He got me routed to NYC and then to Rome. I pretty much collapsed into a seat after running to the gate in Miami. My energy was gone. I smelled pretty bad. I’d run the gauntlet to make that plane. But I did it! And of course, I was not the only one feeling tired but very grateful for the help of the good people of Miami for being hard at work on a very difficult day. This is me — at New York City’s JFK airport — after bathing in a public women’s room there. Yep, I actually washed my hair and pulled out my blow drier. I modestly bathed fairly fully in between planeloads of women coming in after their flights. I fully changed my clothing. The women who came upon me were kind and forgiving. 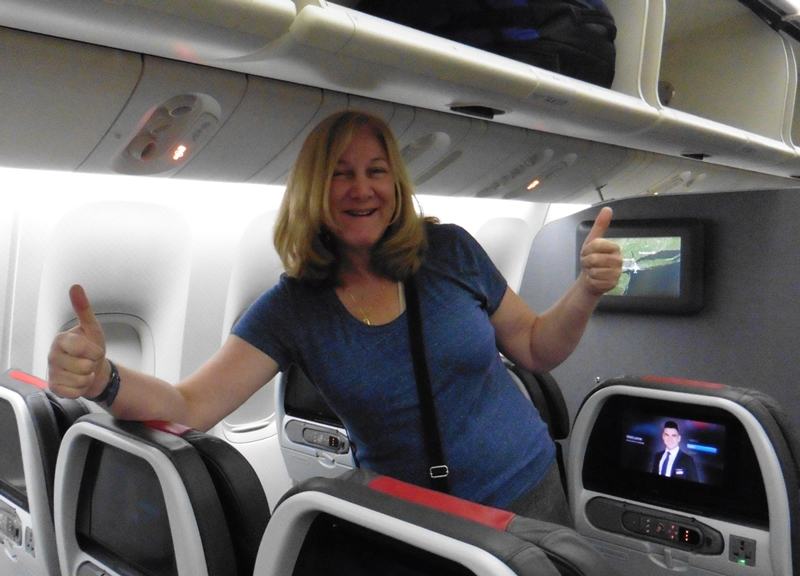 I simply was not willing to get on a 9-hour plane ride and make the flight unpleasant for everyone around me. Nor was I willing to land in Rome and continue my journey to Sicily feeling so uncomfortable. * I am not happy with the AA supervisor who, rather than giving me any help or advice or hope at all, admonished me for caring that AA stranded me rather than feeling sorry enough for her — when she had no idea how my heart went out to those in Miami and of my profound thanks to them for coming to work. I am happy though, that a representative took my report about this and the complete circumstances, apologized, and said he will be reporting the issues. About to finally leave US ground! So happy! Now I got even luckier! The woman who had this comfy seat you see me in wanted a window seat and asked to trade with me! So for over 9 hours, I had a middle seat — with extra legroom! It isn’t perfect for sleeping but after trying to sleep on the Miami airport floor and having not slept in a couple of days already, I knew I would fall asleep anywhere. One thing I love about the seats on the American Airlines flights I’d been on during this trip is that the headrest folds on both sides to cradle your head if you’re the right height. Perfect for me. So here I am on board the flight to Rome! On my way! Between two very nice people — a couple who wanted window and aisle and were very kind to me on this packed flight. My original flight booked me into Naples because there hadn’t been any miles award seats into Sicily when I’d booked. I strongly believe that American Airlines could have easily helped right the wrong of insisting I remain routed through Miami post-hurricane, by putting me onto a flight directly to Sicily, but even my Miami hero couldn’t get them to do that. 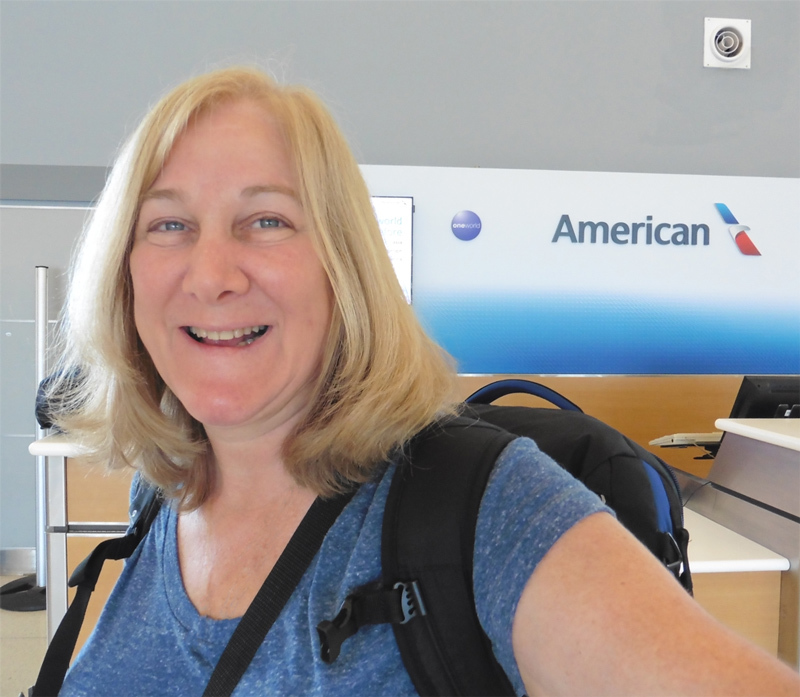 I wish that during my hours at JFK while I wanted for my onward flight to Rome, I’d booked an inexpensive flight from Rome to Sicily, but I was so tired and dazed that I didn’t have the mind to think of that. Seated on the flight to Rome, the man beside me thought of it and I started to book such a flight on Vueling Airlines. However, we taxied before I could complete the transaction. Ironically, we then sat on the runway for over an hour — but such is life and I was still thrilled to be knowing I’d at least get to Rome this day. Upon landing in Rome, I had very little time. The hour-plus loss on the runway ate into my planning time. Running to Vueling Airlines was not possible. So I approached the partner airline that American had me booked on to Naples. They told me they had many seats all day long into Sicily but due to the partnership, they could not give me one. It was pricey to purchase a seat at this late time. I had no time to run back to American Airlines’ desk so a very kind woman at information phoned them for me, holding a conversation in Italian. I believe she explained to them and forwarded my reasons for the request, but they remained absolute: $300 to change my destination. No rerouting as a way to make up for insisting I (a) keep my booking on a defunct airline and (b) fly into post-hurricane Miami to maybe get onto the defunct airline. All too soon it was time to rush onto the transport to the Naples-bound flight. On that transport, a man suggested that I don’t take that flight but get on a ferry direct to Sicily instead. 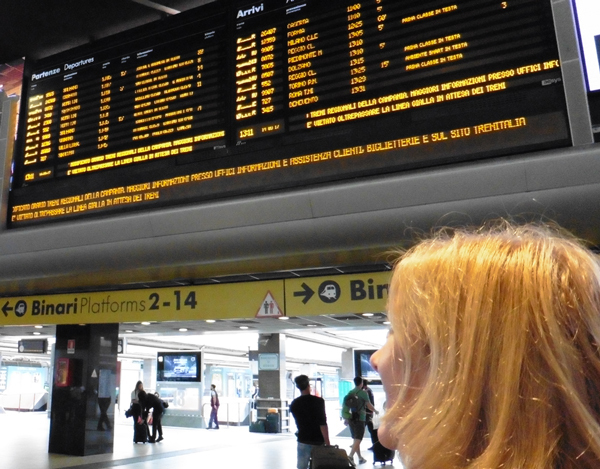 However, I was already booked onto the flight and was far too tired to try to find the ferry or a train in Rome. I flew on to Naples. I had researched so already knew there was an overnight ferry that cost 44 euros including taxes and a seat on which to rest for the 10.5-hour duration. However, that would have me waiting at the ferry terminal for yet more hours. I opted for the more costly train. 55 euros plus a 5 euro booking fee. Into Catania rather than my true destination of Palermo. Rather than having to take 2 city buses to the Napoli train station, there is an easy bus that stops only at the Train Station and then the Ferry Terminal. I attempted to find that bus 3 times, with 3 different sets of different finger-pointing directions. Why couldn’t I find that bus? Have you guessed it? The bus was on strike — not going to run that day. So 14 euros later I arrived at the train station by taxi having shared the costly ride with a traveling Italian man. I did not want to miss that train! There were no seats in the train station. As I stood for my last hour, I felt my feet burn. I’d been in those shoes for days and nights now. The train is interesting. At the end of the mainland, it stops on some siding and after waits and track negotiation, it travels onto the ferry. Two trains balance the ferry. Then the train negotiates the track again and is on its way in Sicily. On Ferry deck looking down at the trains. 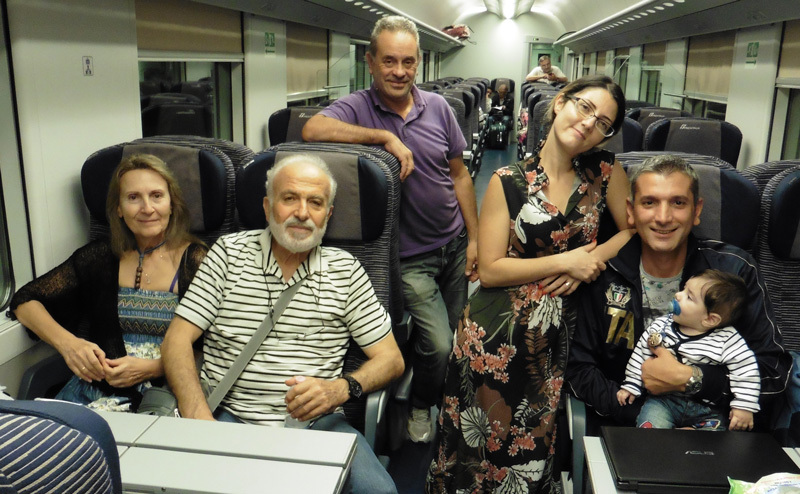 My train/ferry friends from Napoli to Catania. During the ride, people were nice. I needed to find a place to sleep — but I didn’t have an Italian SIM card yet. I approached the family and a Greek couple that had not really spoken to me yet and asked for help. They immediately befriended me and offered me phones. The Sicilian man suggested some web searches to his wife. I explained about a potential CouchSurfing host and they let me phone him. (That didn’t work well as the host wasn’t comfortable speaking English on the phone.) Then they let me call the hostel nearest to the train station and I booked a bed. And so I arrived in Catania, Sicily! The families pointed the way for me to walk. I arrived at the hostel, washed up, ate a midnight meal of Calzone downstairs, then crashed out until book out time. My 4th long-term set of travels had begun!